Contributed by Robbie Flowers, PhD. Forest Entomologist for the USDA Forest Service, Forest Health Protection. Central Oregon Forest Insect and Disease Service Center. As spring transitions into early summer in Central Oregon, we'll begin to see more than just warmer weather and tank tops but also the return of an insect that has a deep and historic connection with this area. 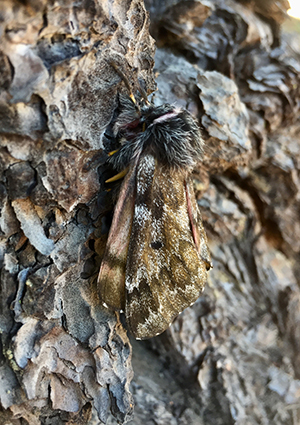 It’s commonly known as the Pandora moth, Coloradia pandora (Lepidoptera: Saturniidae), and they have returned (again) to a central Oregon forest near you. If you were in the Bend area last summer, you’ll remember a large number of moths that were present in many areas of town and the surrounding forests. They were particularly abundant near outdoor lights at homes and businesses and appeared in rather spectacular fashion at Vince Genna Stadium to help in supporting the Bend Elks baseball club. The adults we see in odd calendar years during outbreak events give way to larvae in even calendar years, and so we can expect to see areas of significant defoliation of pine-dominated areas this summer. It is suspected that we are now in year 4 of an 8-year outbreak cycle of the Pandora Moth. The Pandora moth is native to the western United States and periodic outbreaks have occurred in many areas. The first recorded outbreak in Central Oregon was in the 1890s on the Klamath Indian Reservation. Pandora moth generally occurs only in areas with loose, granular, volcanic soils, which are needed for them to complete their life cycle. Tree-ring analyses of old growth ponderosa pine suggest that over 22 outbreaks have occurred here during the past 600 years. And, while the adults tend to be primarily only a nuisance around homes and businesses, the larvae can cause extensive defoliation of pine-dominated forests and result in growth loss and even some tree mortality when coupled with other stress such as ongoing drought or bark beetle outbreaks. During outbreaks, the defoliation occurs every other year because Pandora moth requires two years to complete one generation. The eggs that were laid by female moths last fall then hatched into larvae that fed in small colonies on last year’s foliage. These larvae overwinter on the tree, often at the base of the needles, and resume feeding in the spring as conditions allow. Given our mild winter this year, a small number of larvae have already been seen in low elevation areas along the Cascade Lakes highway. As these larvae continue to grow and feed, we can expect much heavier defoliation to occur in the coming weeks. Their feeding is usually completed by late June after which they move down from the trees and into the soil to pupate. It is during this exodus from the trees that they are most often observed by the public and may be a nuisance due to their sudden appearance along trails and roads or in camping and recreation sites. Those larvae that do not find the bottom of hiking boots or car and bike tires will transform into adults and the cycle continues. Defoliation caused by the Pandora moth larvae. However, outbreaks are usually short-lived and last for only 3-4 generations (6-8 years). 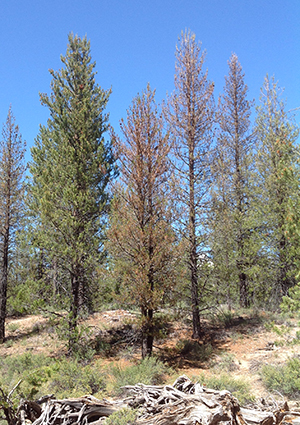 It is suspected that we are now in year 4 of the current outbreak cycle as increasing numbers of adults were observed in 2015 and 2017, while larvae defoliated small areas to the south and west of Bend in 2016. The defoliation that year was most evident near Lava Butte, but by mid-summer when the flush of new needles had occurred it was not nearly as apparent. In terms of “managing" these outbreaks, direct action against the insects themselves is rarely warranted. This is due in part to the effects of the defoliation being reduced because of the 2-year life cycle, which allows time for the trees to recover. It is also because Pandora moth outbreaks have historically subsided rather quickly due to a variety of native, natural enemies that serve to keep populations at low levels and/or contribute to the collapse of outbreaks. One of the most important is a disease caused by a virus, which rapidly infects and kills larvae. Small mammals also feed on the pupae in the soil and have been reported as another important control, while many species of birds along with predatory and parasitic insects are known to feed on Pandora moth eggs and larvae. In contrast, ongoing management of pine-dominated forests in commonly affected areas is recommended using treatments such as thinning or prescribed burning to aid in restoring and maintaining the appropriate tree species and densities for those areas. Increasing forest health and improving tree vigor not only keeps the trees growing well but also allows them to more quickly recover from the effects of defoliating insects like Pandora moth and other stressors.